With all of the hoopla now surrounding Daft Punk and their delicious piece of “stripped-down” electronica that’s been released this month, we decided to unveil a few careful tidbits about the album’s origins, development and its present-day majesty. Many of the music mags and online bloggers have already given out their report cards on the album and are doing everything they can to expand on their coverage, as if the robots are taking over the Earth, but you may have missed out on these factoids. Compare the front and back of Random Access Memories with Michael Jackson’s landmark 1984 album Thriller and you’ll witness the similarities they both have. So Daft Punk didn’t want to be found hugging up with a baby tiger on its front cover; big deal. What we have learned is that both albums bear a black background and the same font style. Weird coincidence? Or are we just paying homage to greatness? You be the judge of that. Straight from the robot’s mouths, Daft Punk admits that they were looking to embrace the sounds of the West Coast. When you look at the actual directory of musicians collaborating on this album, you could clearly see this as their need to pull of a Quincy Jones production. What’s old is new again. It’s a common phrase that’s used from time to time, and here is no exception. Not only has Daft Punk done all they could to bring live instrumentation to their latest offering, but they are dropping their full-length episode on vinyl. Two 180-gram double vinyl records will be encased in gatefold packaging and will also include an eight-page booklet archiving all the album’s personnel For fans of anything digital, you’ll get a bonus treat: a digital download code comes with the full album. It’s common courtesy nowadays in vinyl editions of newly-released records to put digital download cards inside the sleeves. Indie stores are quickly selling out of their vinyl versions and are having a hard time stocking them. “They’re just selling really quickly,” said a clerk at Rasputin Music on Powell Street in San Francisco, explaining why he wouldn’t put a copy on hold for us. The store only had two vinyl editions left as of 3:45 this afternoon. Amoeba Music in Berkeley sold out of the album around 11:30 or noon today, according to the store’s clerk. Can’t get to a mom-and-pop store? Copies are available at Amazon.com and at MyPlayDirect’s website. Daft Punk’s career stretches all the way back to the ’90’s, but Random Access Memories will become a milestone on their resume when it takes the Number One spot next week on the Billboard 200. That’s what forecasters and SoundScan analyzers are predicting. Thanks to a large amount of online pre-orders, iTunes LP pre-orders and anxious fans who want to “get lucky,” the group’s 2013 album is expected to sell somewhere near 300,000 on its first week. That’s a major start for the French EDM-chiseled pair, becoming the second-largest debut week in 2013 so far. Justin Timberlake currently holds the crown for having the most units sold in its first week for The 20/20 Experience (968,000). And that’s not even the end of the good news. 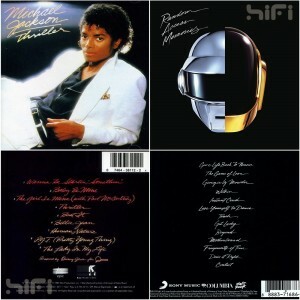 Random Access Memories is expected to sell more copies in its first week than Daft Punk’s last album, 2005’s Human After All, has sold to date. “Get Lucky” is also doing a fantastic job on the Billboard Hot 100, as it jumps 15-10 this week. It is their first Top Ten hit of their career and is already the biggest selling single of 2013 to date. 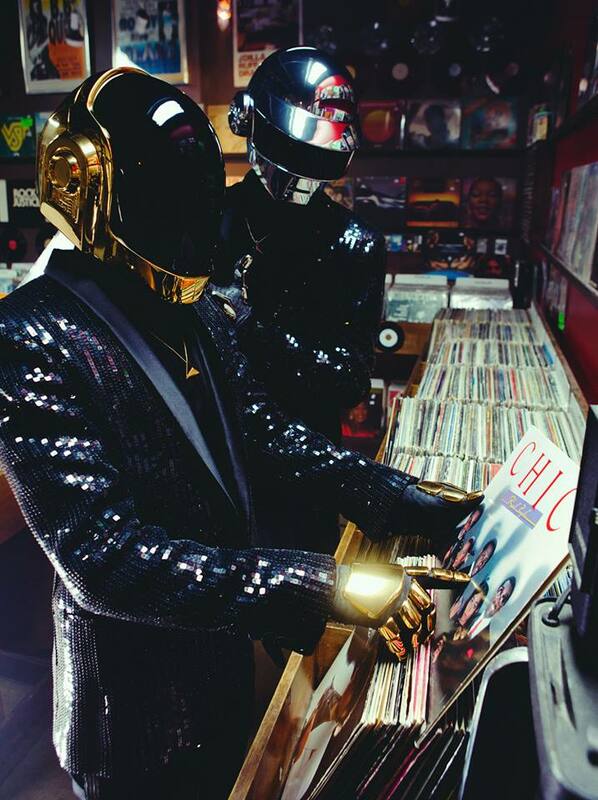 French EDM giants Daft Punk discovering Chic on vinyl. Look closer at the vinyl record in the front of them and you can probably make it out to be Michael Jackson’s Thriller. Before #trendingtopics were thought of, Daft Punk made a name for themselves with their magical collection of artsy concept videos. We’ve seen their brilliant work shown in videos for the emotionally driven “Da Funk,” the cool-looking “Around the World” and the Gem and the Holograms-looking “One More Time.” With Random Access Memories here and now dear to us, the pair have been a bit tight-lipped about producing concept videos for this album. The possibility is still there, since the demand is definitely there. Tribute videos made by fans pasting ‘Get Lucky” on top of old footage of Soul Train dance lines can be easily located on YouTube, and Parnex has even used clips of futuristic simulation gaming on a two-minute version of “Instant Crush.” If Daft Punk had enough time to whip out one-minute commercials with Pharrell Williams and Nile Rodgers playing alongside them for SNL and Coachella, then there’s a strong possibility that a music video might be constructed. But Billboard spent a little time out of their busy schedule to ditch the idea. A masterful eight episodic series was developed and released before the album dropped. Produced by intel and Vice, each segment focused on a guest collaborator and went through the motions of detailing their experience with Daft Punk and the music at hand. Naturally things kick off with synth wiz and famed Donna Summer producer Giorgio Moroder. And then comes UK garage/house producer Todd Edwards and next was Chic guitarist and famed producer Nile Rodgers, who worked on three of the album’s tracks. And the ball just kept on rolling. DJ Falcon, Panda Bear, Pharrell Williams, pianist Chilly Gonzales and album influence Paul Williams (the brains behind the Phantom of the Paradise score) all contributed to the series. It would be nice of a “behind-the-music” documentary complied all of this important footage for a future expanded version of Random Access Memories, but they are all featured at the album’s official website and at The Creators Project channel at YouTube.